Honorary Degree of Doctors of Laws, As-Syafi'ya Islamic University [May 2011]. Honorary Degree of Doctor of Laws, Smith College [May 2010]. The WAGGGS World Citizenship Award [ June 2005 ]. The Dr. Naito International Childcare Award [ June 2001 ]. The UNESCO 50 Years Commemorative Medal [ March 2000]. Honorary Degree of Doctor of Laws from the University of Reading, UK [ July 1998 ]. Voted Arab Woman of the Year 1995 at the Arab Regional Preparatory Meeting of the Fourth World Conference on Women. Honorary Fellow of Pembroke College, Oxford University [ December 1994 ]. In July 1994, His Majesty the late King Hussein bestowed The Grand Cordon of the Jewelled Al Nahda "Renaissance" upon Her Royal Highness Princess Basma for her development efforts and humanitarian services to her country. 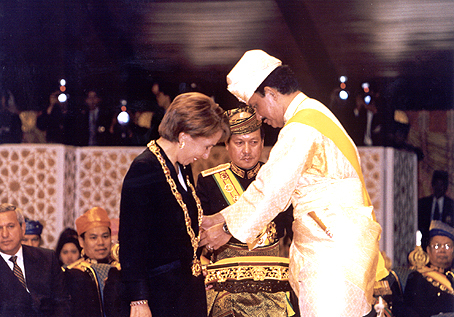 In July 2000, His Majesty Sultan Haji Hassanal Bolkiah Mu′izzadin Waddaulah, Sultan and Yang Di-Pertuan of Brunei Darussalam, bestowed upon Her Royal Highness Princess Basma the Most Esteemed Family Order Laila Utama of Negara Brunei Darussalam. First Class Order of the Precious Crown, Japan. Great Cross of Isabel the Catholic, Kingdom of Spain. Commander Grand Cross Royal Swedish Order of the Polar Star. Grand Decoration of Honour in Gold with Sash, Republic of Austria.